Even though my grandfather’s family settled in the Southern Appalachians generations ago, the relatives who still reside here are all strangers. It could be the early morning delirium, but I have the feeling I am meant to hunt here. I’ve been convinced by Ultimate Uplanders, Johnnie and Robbie, that bird hunting is alive and well in these parts. 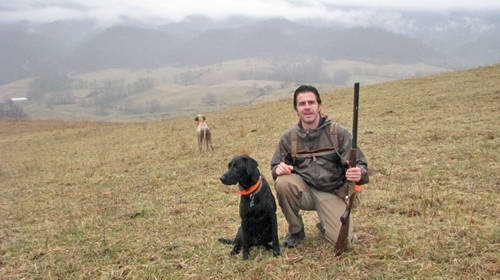 They have lived in the area their entire life and recite the names of individual peaks and landowners with equal ease.Robbie’s 3-year-old English Setter, Boomer, swallows ground like no dog I’ve ever seen. 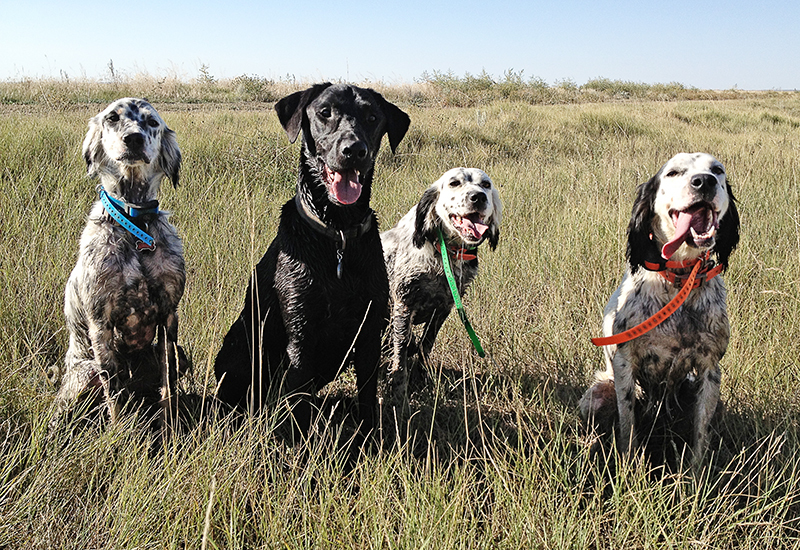 My lab Wyatt had the chance to hunt with setters in South Dakota this year and it worked out well. But that was prairie and these are dense stands of hillside trees, so I’m not certain what to expect. Conventional wisdom dictates that close working pointing breeds were the dog for the grouse woods. 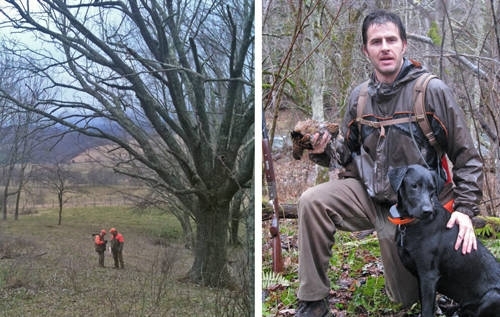 However, these Virginia boys have little interest in convention; they let their experience and results in the field determine how they hunt.Johnnie and Robbie are using the GPS collars that hunters traditionally run out West for long legged pointers. On the prairies the primary function is distance, but it is a cover penetrating beacon in the grouse woods. Boomer is by no means a long running dog, but ranging past 150 yards might make the ruffed hunting traditionalist cringe. This collar allows Boomer to hunt free. While Wyatt is trying to figure out why we’re in the woods, that handsome setter just runs and runs and runs. Magnificent. I give Robbie a full ration for using these “cheater” collars. But it quickly becomes apparent that the collar is ancillary. The primary tool for hunting birds in this territory is legs and you better have a good set. The GPS collar may allow you to flush more birds, but it by no means guarantees shots. Boomer proves this again and again over the course of two days. The on-point indicator sounds and gives distance and direction, either straight uphill or straight down through wicked cover. And these late season birds aren’t gonna hold all day so the race is on. Boomer doesn’t get tired and he is rarely wrong. The only guarantee the GPS collar offers in this setting is that your legs and lungs will burn. I quickly realize that Wyatt is so accustomed to keying off my actions, that if I don’t start tackling the cover he thinks we’re out for a leisurely walk. The bird density here is less than the other species he’s hunted, which is making him unsure of the game. So off trail and into the cover we go together. I’m not saying that flushers are impossible to use in this ruffed scenario, but I do have some setter envy over the weekend. Thankfully Rio, our 6-month old Llewellin from Jornada Setters, is quickly growing up. On this unseasonably warm Winter day we manage to raise eight birds, a little better than one per hour. Wyatt even gets into the game with a couple of flushes. The ribbing I give Robbie over the cheater collar comes back in spades when I miss one of the easiest shots I’ve had all season. Shocked when a big red phase bird flies straight at me, I blow it. This of course gives Robbie the chance to return a well deserved full ration. The heat wave of yesterday is long gone, replaced with frigid precipitation and dense fog. There are two options for today’s guaranteed soaking: wear heavy duty rain repellant gear that makes me sweat buckets or wear the lighter weight gear and allow mother nature to do her worst. I opt to let the rain in because I know Wyatt will have me hiking hard and it seems preferable to heat stroke. Since Wyatt wants me busting the cover with him, I decide to start peeling off from the Old Dominion boys to outflank these birds, letting Boomer cover the middle ground. I listen to his bell as he devours the hillsides while Wyatt and I work the left flank chugging to the top of the ridge. As I crest the peak I see Wyatt get that look. Before I can even react there’s a brief khaki flash that disappears into the next hollow. I’m left standing there wondering if it was a figment of my imagination with Wyatt offering minimal clues. Was that a wild flush 40 yards out? My angling path runs us periodically across the Virginia crew where we compare notes. Boomer has had points but no verified birds. 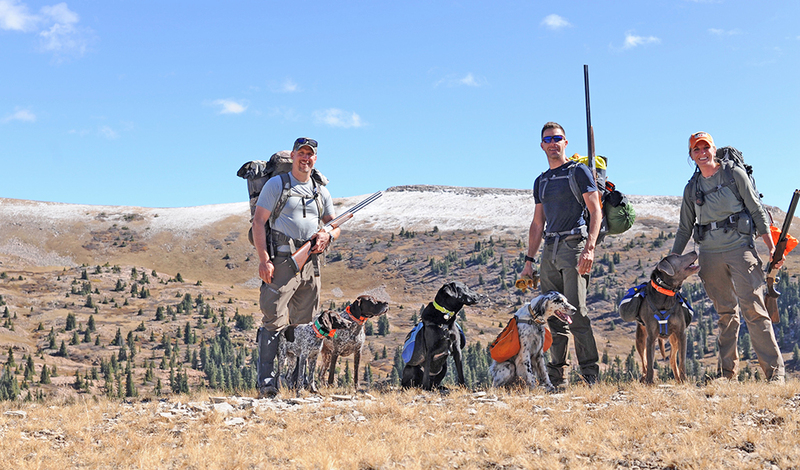 We decide to hunt back to the truck to try a different mountain for a change of fortunes. The rain greets this decision with renewed vigor. The carpool ride to the next location renews our energy. We park at the landowner’s house and start the uphill hike to cover. And we add a new member to the hunting party, a punt – the term I lovingly use for all dogs of relative football size. Robbie attempts to dissuade this punt from joining the hunt, but he is a hard headed, short legged, stubborn fur ball. We’ll probably be drawing straws later to decide who is carrying this thing back to the house once Boomer runs it all over hell and back. Once we reach the woods the dogs immediately seem more interested, maybe the punt has sparked something. Boomer gets a wild flush and we have a general idea of the direction. Johnnie and Robbie see another wild flush and they get a good bearing to pursue. Finally a bird holds for Boomer’s point and the Virginia boys respond with the day’s first salvo by cutting holes in the deluge but nary a single feather. Again, we have a good mark down on this bird and we stick to the same flanking strategy. The punt alternates between shadowing Wyatt and Boomer as we snare this bird again. After less than 100 yards I see Wyatt kick into bird gear and I know we’re closing. We approach a logging trail and I slide my thumb to the safety. I’m seven yards away as Wyatt and the punt jump this bird. It climbs to my right and I don’t even have time to mount the gun as it places the largest tree in the woods between us. Thankfully, Wyatt is figuring out the game and we’re training this punt-rat-dog to be a grouse hunter too. I get to see a flush up close and personal in these brutal conditions, but the bird flies in the one direction that offers no shot. We talk it over and all agree that this grouse has played by the rules and deserves a pass. So we break pursuit and head the opposite direction to find another. I end up on a trail by a river with the Virginia crew working a ridge to my right. I take in a few deep breaths. The cling of my drenched shirt and the sound of Boomer’s bell make me smile. The lunacy of hunting in these conditions is genuine entertainment. And as if on cue I see Wyatt’s slicked black coat 30 yards out as he pushes a rust rocket airborne from the trail edge. I watch the banded tail climb as I raise and level my gun. I shoot twice without thought and the bird tumbles back to earth. Johnnie and Robbie meet me with big smiles and congratulations. I now hold my first Ruffed Grouse and I am humming. We hunt the rest of the day without seeing another bird. And it doesn’t matter. Fueled by the success of the Virginia hunt I decide to make my final stand in North Carolina as the upland seasons come to a close. For a few weeks I scout the highlands with little more than a hint of potential grouse cover. Though there is a massive amount of huntable National Forest in this area, a good portion is still privately owned. Moreover, the private land tends to be around the roads so gaining access to the National Forest is often a challenge. I start placing phone calls to friends and national forest offices while digging online for intel that can help put me on grouse. And eventually I find hope on a mountain north of Morganton. Rio, Wyatt and I finally flush a bird from a logging trail while hiking. Rio has not been shot over yet, so I’m without a gun. But this is the only sign I need. The cover is right, access is available and this bird sighting convinces me to go all in. Luckily I’ve persuaded some Ultimate Uplanders to join in on this long shot – Brian, a marketing executive for Beretta and his 14-year-old son Zach. Brian has brought along the new Silver Pigeon I for me to test in this cover. I’m hoping it is the good luck charm. The gun is comfortable and the 686 frame is no stranger, it is one of the iconic doubles of our age. I switch out the chokes to the included cylinder and improved-cylinder because I know any shots on these mountains defined by rhododendron and laurel thickets will be fleeting. Local knowledge is invaluable and you have to put in the time to find these birds. The plan is to make a big down payment today. I’ve separated this mountain into three segments, covering different elevations and focusing on suitable cover on the different faces. We cast off on the first leg accompanied by brisk air temperature but lots of sun which will eventually push the mercury to another unseasonably warm February day. I’ve warned my hunting companions of the long odds, but Brian and Zach are native Tarheels and they are just as happy as I am to embark on this endeavor on home turf. We spend the morning covering rough terrain through mixed cover and on occasion Wyatt indicates a bird has shared this mountain. But the grouse have vanished from this face and the depth of the rhododendron make it very apparent how easy that trick could be. We do end up locating a nicely sheltered trout stream which will definitely require more exploring with a rod in the Spring. Lunchtime has arrived and we hoof it back to the truck to reenergize. Zach is an experienced hunter for his age and obviously has been well trained by his dad in gun safety. Over lunch we share stories of previous hunts, dogs and good times afield. 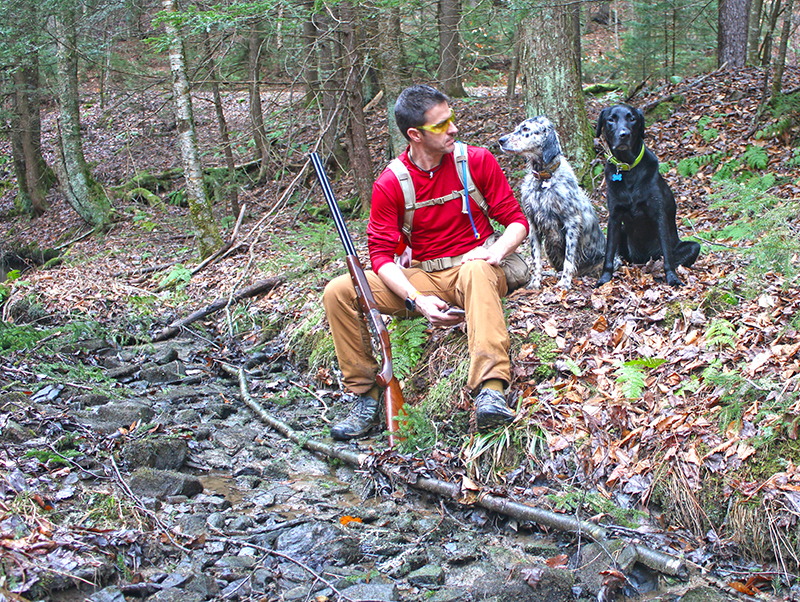 This southern Appalachian grouse hunting is challenging for young people because success is not easily defined. But I think Zach has a good grasp of why we’re here and he’s just happy to be outdoors as we head toward the afternoon hunting grounds. A logging road intersects the cover as it swtichbacks the elevation on our downhill progress. I’m watching Wyatt closely because he’s acting birdie and as I alert Brian a bird explodes from the laurels in front of us. 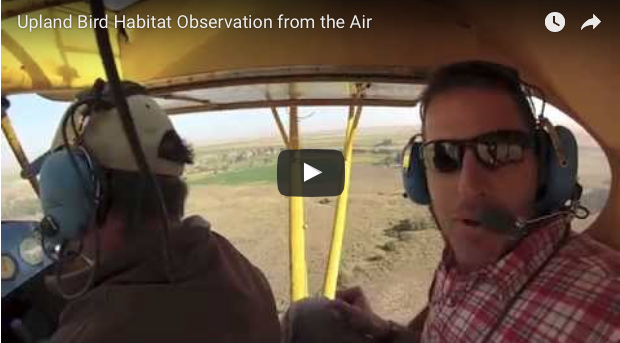 I’ve never seen a turkey fly out of such thick cover. We’re on the board with a flush, just the wrong species. And though we continue to stomp all over this mountain busting cover we’re only rewarded with this one flush today. I’m going to have to test the new Beretta at the range because the off season has arrived. 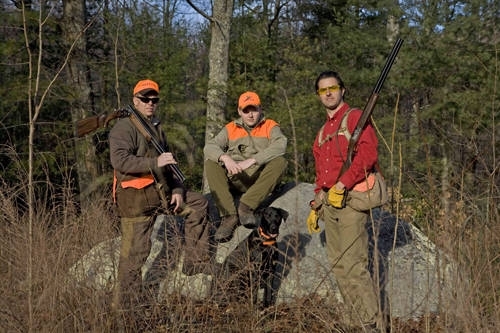 We’ve agreed to reconvene this hunting party in the Fall. There are more areas to scout and more work to put in but we’ve laid a good foundation for earning our first Old North State grouse. *Big thanks to friend, photographer and outdoors enthusiast Kim Hummel for tagging along and making us look good. i live in eastern kentucky, and i sure a relate to this story. i have a 3 year old chocolate lab,, reese, and a 18 month old llewellin, handsome. we have gone many days with out a point or flush. i am a member of ultimate uplander, and i enjoy the site very much. i only discovered your blog tonight and find them true to point and they are very entertaining. Thanks for reading, we try and tell it like it is. Great to have another Ultimate Uplander following us outside the Lodge.